Actor Adrian Grenier is brewing a second career. 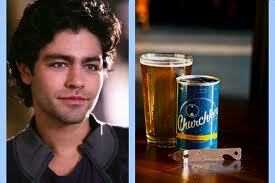 The “Entourage” star and Clinton Hill-based hearthrob recently launched a beer called Churchkey, which has just made its East Coast debut in the newly opened Brooklyn Sandwich Society on Dekalb Avenue in Fort Greene. The beer comes in a bright blue retro-style flat-topped can with no pull tab. Churchkey, co-founded by Portland-based graphic designer Justin Hawkins, takes its name from the small metal device that must be used to pop it open. The brew began selling in stores across Portland and Seattle in early 2012, but only hit Brooklyn when Camilo Dominguez, beer expert at The Brooklyn Sandiwch Society, came across it at a tasting.